This article was originally published in the Journal of Commerce on April 18, 2018. The relationship between NAFTA and auto manufacturing is a complex one. 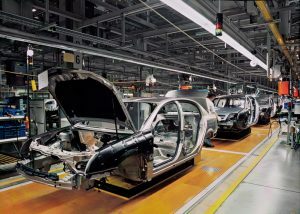 Automakers have established robust and complex continental supply chains that see auto components cross North American borders several times before a finished product is assembled. The cost efficiencies extracted through NAFTA have allowed U.S. automakers to remain competitive against foreign competitors, particularly those in Japan and Korea, who have flooded the North American markets with affordable vehicles. One of the many cost efficiencies U.S. automakers have been able to leverage has been the lower wages in Mexico versus the U.S. or Canada. This has long been a grievance of U.S. and Canadian auto unions that have maintained the position that Mexican labor laws are lax relative to those of its northern neighbors. According to NAFTA, 62.5 percent of auto content must come from within North America. However, in an effort to repatriate jobs, one of Washington’s earliest proposals in the renegotiations of the trade deal was not only to raise the content requirement to 85 percent, but also to require that 50 percent of content comes from within the U.S. The proposal was quickly rejected by both Canada and Mexico and generated significant concern in the auto industry where the proposals were seen as being far too disruptive to their supply chains and had the potential to reduce profitability and competitiveness, and lead to a loss in market share and, in turn, lost jobs. In recent weeks, there’s been a shift in Washington’s position on Rules of Origin. Not only has the U.S. dropped its proposal to have 50 percent of auto content produced in the U.S., it is also adjusting its North American content requirements. While the proposed 85 percent NAFTA regional value content will likely be lowered to 75 percent, the methodology shared by negotiators so far is a significant change. Rather than “tracing” non-originating materials (i.e. materials that are not from within North America) throughout the supply chain as is done today, the new proposal is to group material inputs into three or more categories that must meet certain content thresholds ranging from 65 percent to 75 percent. But it’s an all-or-nothing approach. If the parts in a category meet the content threshold, the total value adds up to 100 percent. If not, they will simply be categorized as having zero originating content. These changes came about after recent and intense consultations with representatives from the auto sector. But the shift in auto-content proposals wasn’t necessarily a capitulation by Washington. In exchange for dropping its proposal for 50 percent of content to come from the U.S., it tabled a new suggestion that would require American automakers to have their auto content produced in jurisdictions with a set minimum wage in exchange for financial credits to help offset the additional labor costs. The idea is to level the playing field so that Mexican labor doesn’t have quite so much of an advantage over U.S. labor. The proposal would ultimately have one of two effects. It would either incentivize U.S. automakers to bring jobs back to the U.S. where labor costs are higher, or it would keep manufacturing in Mexico, but force automakers to increase wages there. The proposal has been greeted warmly by labor unions in all three countries who believe workers will ultimately benefit from the concept. But they’re not alone. Given the recent intensity with which the NAFTA parties have been negotiating – including at the ministerial level – it’s fair to say the new auto proposal is also being given serious consideration by Canadian and Mexican policymakers, as well.